American communications satellite. Intelsat 4A satellites increased satellite capacity to 7250 voice circuits or 2 TV channels. Built by Hughes for Intelsat, International. Launched 1975 - 1978. Used the HS-353 bus. Status: Operational 1975. First Launch: 1975-09-26. Last Launch: 1981-02-21. Number: 10 . Gross mass: 1,520 kg (3,350 lb). Height: 6.80 m (22.30 ft). Spacecraft: Spin stabilized with a despun antenna structure. Hydrazine propulsion system. Passive thermal control. Body mounted solar cells. Payload: Twenty transponders. Multiple access.7250 voice circuits or 2 TV channels. Family: Communications, Geosynchronous orbit. Country: USA. Engines: SVM-4. Spacecraft: Comstar. Launch Vehicles: Atlas, Atlas SLV-3D Centaur. Projects: Intelsat. Launch Sites: Cape Canaveral, Cape Canaveral LC36A, Cape Canaveral LC36B. Agency: Hughes. Bibliography: 126, 2, 278, 6, 5021, 12665, 12666. 1975 September 26 - . 00:17 GMT - . Launch Site: Cape Canaveral. Launch Complex: Cape Canaveral LC36B. LV Family: Atlas. Launch Vehicle: Atlas SLV-3D Centaur. Intelsat 4A F-1 - . Mass: 1,500 kg (3,300 lb). Nation: International. Agency: Intelsat. Program: Intelsat. Class: Communications. Type: Civilian communications satellite. Spacecraft Bus: HS 312 / HS 351 / HS 353. Spacecraft: Intelsat 4A. Completed Operations Date: 1986-07-24 . USAF Sat Cat: 8330 . COSPAR: 1975-091A. Apogee: 35,910 km (22,310 mi). Perigee: 35,860 km (22,280 mi). Inclination: 8.90 deg. Period: 1,441.10 min. Spacecraft engaged in practical applications and uses of space technology such as weather or communication (US Cat C). Launch vehicle put payload into geosynchronous transfer orbit Positioned in geosynchronous orbit over the Atlantic Ocean at 25 deg W in 1975-1981; over the Atlantic Ocean 18.5 deg W in 1982-1983; over the Atlantic Ocean 30 deg W in 1983-1986 As of 30 August 2001 located at 4.05 deg E drifting at 1.213 deg W per day. As of 2007 Mar 10 located at 28.51E drifting at 1.239W degrees per day. 1976 January 29 - . 23:56 GMT - . Launch Site: Cape Canaveral. Launch Complex: Cape Canaveral LC36B. LV Family: Atlas. Launch Vehicle: Atlas SLV-3D Centaur. Intelsat 4A F-2 - . Mass: 1,500 kg (3,300 lb). Nation: International. Agency: Intelsat. Program: Intelsat. Class: Communications. Type: Civilian communications satellite. Spacecraft Bus: HS 312 / HS 351 / HS 353. Spacecraft: Intelsat 4A. Completed Operations Date: 1985-12-19 . USAF Sat Cat: 8620 . COSPAR: 1976-010A. Apogee: 35,981 km (22,357 mi). Perigee: 35,924 km (22,322 mi). Inclination: 9.00 deg. Period: 1,444.60 min. Spacecraft engaged in practical applications and uses of space technology such as weather or communication (US Cat C). 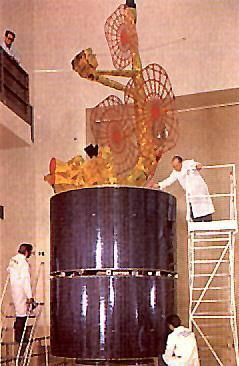 Launch vehicle put payload into geosynchronous transfer orbit Positioned in geosynchronous orbit over the Atlantic Ocean at 29.5 deg W in 1976-79; over the Atlantic Ocean 27.5 deg W in 1979-1980; over the Atlantic Ocean 21.5 deg W in 1980-1983; over the Indian Ocean 57 deg E in 1983-1984; over the Atlantic Ocean 2-4 deg W in 1984-1985 As of 3 September 2001 located at 151.88 deg E drifting at 2.088 deg W per day. As of 2007 Mar 10 located at 130.98W drifting at 2.123W degrees per day. 1976 May 13 - . 22:28 GMT - . Launch Site: Cape Canaveral. Launch Complex: Cape Canaveral LC36A. LV Family: Atlas. Launch Vehicle: Atlas SLV-3D Centaur. Comstar 1 - . Payload: Comstar 1A. Mass: 792 kg (1,746 lb). Nation: USA. Agency: Comsat. Program: Comstar. Class: Communications. Type: Civilian communications satellite. Spacecraft Bus: HS 312 / HS 351 / HS 353. Spacecraft: Intelsat 4A. Completed Operations Date: 1984-10-26 . USAF Sat Cat: 8838 . 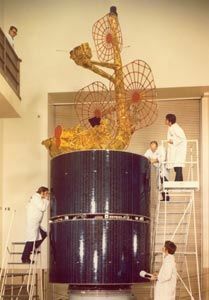 COSPAR: 1976-042A. Apogee: 35,925 km (22,322 mi). Perigee: 35,903 km (22,309 mi). Inclination: 12.70 deg. Period: 1,442.60 min. Spacecraft engaged in practical applications and uses of space technology such as weather or communication (US Cat C). Launch vehicle put payload into geosynchronous transfer orbit Positioned in geosynchronous orbit over the Americas at 128 deg W in 1976-1981 over the Americas at 95 deg W in 1981-1983 over the Atlantic Ocean 76 deg W in 1983-1984 As of 4 September 2001 located at 48.64 deg E drifting at 1.641 deg W per day. As of 2007 Mar 10 located at 31.21E drifting at 1.624W degrees per day. 1976 July 22 - . 22:04 GMT - . Launch Site: Cape Canaveral. Launch Complex: Cape Canaveral LC36B. LV Family: Atlas. Launch Vehicle: Atlas SLV-3D Centaur. Comstar 2 - . Payload: Comstar 1B. Mass: 792 kg (1,746 lb). Nation: USA. Agency: Comsat. Program: Comstar. Class: Communications. Type: Civilian communications satellite. Spacecraft Bus: HS 312 / HS 351 / HS 353. Spacecraft: Intelsat 4A. Completed Operations Date: 1993-12-19 . USAF Sat Cat: 9047 . COSPAR: 1976-073A. Apogee: 35,887 km (22,299 mi). Perigee: 35,855 km (22,279 mi). Inclination: 12.60 deg. Period: 1,440.40 min. Spacecraft engaged in practical applications and uses of space technology such as weather or communication (US Cat C). Launch vehicle put payload into geosynchronous transfer orbit Positioned in geosynchronous orbit over the Americas at 95 deg W in 1976-1983 over the Americas at 76 deg W in 1983-1993 As of 28 August 2001 located at 172.63 deg W drifting at 1.031 deg W per day. As of 2007 Mar 10 located at 150.18W drifting at 1.064W degrees per day. 1977 May 26 - . 21:47 GMT - . Launch Site: Cape Canaveral. Launch Complex: Cape Canaveral LC36A. LV Family: Atlas. Launch Vehicle: Atlas SLV-3D Centaur. Intelsat 4A F-4 - . Mass: 1,500 kg (3,300 lb). Nation: International. Agency: Intelsat. Program: Intelsat. Class: Communications. Type: Civilian communications satellite. Spacecraft Bus: HS 312 / HS 351 / HS 353. 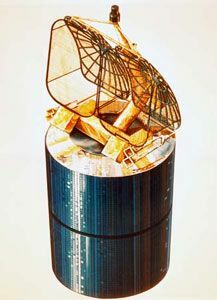 Spacecraft: Intelsat 4A. Completed Operations Date: 1989-08-10 . USAF Sat Cat: 10024 . COSPAR: 1977-041A. Apogee: 36,075 km (22,415 mi). Perigee: 35,969 km (22,350 mi). Inclination: 7.80 deg. Period: 1,448.20 min. Spacecraft engaged in practical applications and uses of space technology such as weather or communication (US Cat C). Launch vehicle put payload into geosynchronous transfer orbit Positioned in geosynchronous orbit over the Atlantic Ocean at 34.5 deg W in 1977-1983 over the Atlantic Ocean 21.5 deg W in 1983-1989 As of 28 August 2001 located at 153.30 deg E drifting at 2.976 deg W per day. As of 2007 Mar 10 located at 121.69W drifting at 3.003W degrees per day. 1977 September 30 - . 01:02 GMT - . Launch Site: Cape Canaveral. Launch Complex: Cape Canaveral LC36A. LV Family: Atlas. Launch Vehicle: Atlas SLV-3D Centaur. FAILURE: Atlas failure - gas generator hot gas leak.. Failed Stage: 1. Intelsat IVA F-5 - . Mass: 1,500 kg (3,300 lb). Nation: International. Agency: Intelsat. Program: Intelsat. Class: Communications. Type: Civilian communications satellite. Spacecraft Bus: HS 312 / HS 351 / HS 353. Spacecraft: Intelsat 4A. Decay Date: 1977-09-29 . 1978 January 7 - . 00:15 GMT - . Launch Site: Cape Canaveral. Launch Complex: Cape Canaveral LC36B. LV Family: Atlas. Launch Vehicle: Atlas SLV-3D Centaur. Intelsat 4A F-3 - . Mass: 1,511 kg (3,331 lb). Nation: International. Agency: Intelsat. Program: Intelsat. Class: Communications. Type: Civilian communications satellite. Spacecraft Bus: HS 312 / HS 351 / HS 353. Spacecraft: Intelsat 4A. Completed Operations Date: 1988-11-16 . USAF Sat Cat: 10557 . COSPAR: 1978-002A. Apogee: 35,909 km (22,312 mi). Perigee: 35,874 km (22,291 mi). Inclination: 7.20 deg. Period: 1,441.50 min. Spacecraft engaged in practical applications and uses of space technology such as weather or communication (US Cat C). Launch vehicle put payload into geosynchronous transfer orbit Positioned in geosynchronous orbit over the Indian Ocean at 60 deg E in 1978-1982 over the Pacific Ocean 179 deg E in 1982-1986 over the Pacific Ocean 177 deg E in 1986-1988 As of 2 September 2001 located at 156.51 deg W drifting at 1.304 deg W per day. As of 2007 Feb 27 located at 107.90E drifting at 1.326W degrees per day. 1978 March 31 - . 23:36 GMT - . Launch Site: Cape Canaveral. Launch Complex: Cape Canaveral LC36B. LV Family: Atlas. Launch Vehicle: Atlas SLV-3D Centaur. Intelsat 4A F-6 - . Mass: 826 kg (1,821 lb). Nation: International. Agency: Intelsat. Program: Intelsat. Class: Communications. Type: Civilian communications satellite. Spacecraft Bus: HS 312 / HS 351 / HS 353. Spacecraft: Intelsat 4A. Completed Operations Date: 1986-12-29 . USAF Sat Cat: 10778 . COSPAR: 1978-035A. Apogee: 35,823 km (22,259 mi). Perigee: 35,758 km (22,218 mi). Inclination: 11.60 deg. Period: 1,436.30 min. Spacecraft engaged in practical applications and uses of space technology such as weather or communication (US Cat C). Launch vehicle put payload into geosynchronous transfer orbit Positioned in geosynchronous orbit over the Indian Ocean at 63 deg E in 1978-1982; over the Pacific Ocean 174 deg E in 1982-1986; over the Pacific Ocean 170 deg E in 1986 As of 26 August 2001 located at 92.43 deg E drifting at 0.407 deg E per day. As of 2007 Mar 11 located at 75.50E drifting at 0.437W degrees per day. 1978 June 29 - . 22:24 GMT - . Launch Site: Cape Canaveral. Launch Complex: Cape Canaveral LC36B. LV Family: Atlas. Launch Vehicle: Atlas SLV-3D Centaur. Comstar 3 - . Payload: Comstar 1C. Mass: 1,520 kg (3,350 lb). Nation: USA. Agency: Comsat. Program: Comstar. Class: Communications. Type: Civilian communications satellite. Spacecraft Bus: HS 312 / HS 351 / HS 353. Spacecraft: Intelsat 4A. Completed Operations Date: 1986-05-21 . USAF Sat Cat: 10975 . COSPAR: 1978-068A. Apogee: 36,172 km (22,476 mi). Perigee: 36,007 km (22,373 mi). Inclination: 11.50 deg. Period: 1,451.60 min. US domestic telephone service. Spacecraft engaged in practical applications and uses of space technology such as weather or communication (US Cat C). Launch vehicle put payload into geosynchronous transfer orbit Positioned in geosynchronous orbit over the Americas at 87 deg W in 1978-1984 over the Americas at 76 deg W in 1984-1986 As of 1 September 2001 located at 101.79 deg W drifting at 3.884 deg W per day. As of 2007 Mar 4 located at 39.19E drifting at 3.878W degrees per day. 1981 February 21 - . 23:23 GMT - . Launch Site: Cape Canaveral. Launch Complex: Cape Canaveral LC36A. LV Family: Atlas. Launch Vehicle: Atlas SLV-3D Centaur. Comstar 4 - . Payload: Comstar 1D. Mass: 1,520 kg (3,350 lb). Nation: USA. Agency: Comsat. Program: Comstar. Class: Communications. Type: Civilian communications satellite. Spacecraft Bus: HS 312 / HS 351 / HS 353. Spacecraft: Intelsat 4A. USAF Sat Cat: 12309 . COSPAR: 1981-018A. Apogee: 35,792 km (22,240 mi). Perigee: 35,783 km (22,234 mi). Inclination: 7.20 deg. Period: 1,436.20 min. Spacecraft engaged in practical applications and uses of space technology such as weather or communication (US Cat C). Launch vehicle put payload into geosynchronous transfer orbit Positioned in geosynchronous orbit at 142 deg W in 1981; 127 deg W in 1981-1985; 76 deg W in 1985-on. As of 31 August 2001 located at 25.65 deg W drifting at 1.067 deg E per day. As of 2007 Mar 11 located at 78.95E drifting at 0.039W degrees per day.